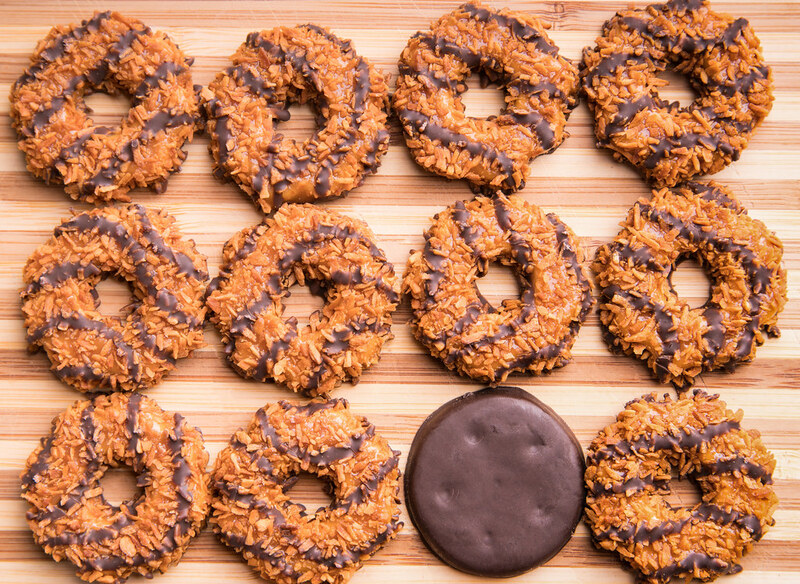 Girl Scout Cookies just got that much groovier. Bring out the cash flow and the sweatpants, it’s that time of year again. Valentine’s Day, sit back down. I’m talking about Girl Scout Cookies Season. Pants will fit a bit tighter and smiles will shine a little brighter all due to the young cookie moguls in green skirts, outside of your local Winn-Dixie. Not all heroes wear capes… right? I grew up as one of these girls and now I’m spending my adolescence giving them all of my money. We’re all well aware these cookies go great will a tall cup of milk. But if you’re looking for some sensory euphoria, consider this your Bible. These glorious cookies elicit particular feelings. So does music. See where I’m going with this? There are certain kinds of cookies that taste as if they were made specifically for individual music genres. As a lover of both Girl Scout Cookies and music alike, I’ve come up with the ultimate Girl Scout-music ships. Thin Mints make everyone feel some type of way. As do love ballads. It’s the perfect combination of fresh minty flavor, heartwarming lyrics, rich chocolate coating, and chill-inducing melodies. Thin Mints and love ballads are a couple written in the cosmos. So whip out the John Mayer, Ed Sheeran, and Adele. It’s time to fall in L-O-V-E with some good tunes and some even better cookies. Valentine’s Day, you can stand back up now. Tagalongs are the equivalent of the wild child in the Girl Scout Cookie family. You’ve got the actual cookie foundation, then the peanut butter, and then the deliciousness of the chocolate layer. It’s basically a rave in your mouth. *cue the Chainsmokers* That’s why I’ve paired Tagalongs with Big Room EDM. The party cookie with the fiesta genre. Listen to some Sam Feldt, Zedd, and Diplo while you munch on these cookies and you’ll be in a state of sensory bliss. The shortbread cookie is an American classic. It’s the suburban soccer mom driving around in a minivan cookie. This American archetype is best paired with classic American rock. Bob Dylan’s drawl will sail beautifully over the Trefoils’ sugary yumminess. It's your safety duo. Your mom was never late pick you up from practice. Led Zeppelin never released a bad song. And Trefoils never delivered anything but sheer joy to your palate. At last, we've reached my personal favorite. I’m still confused about the name change too. Because of my childhood, I’ll forever be Team Samoas. But apparently, “Caramel deLites” and “Samoas” are interchangeable. Weird, I know. It’s all good, though, the taste redeems the confusion. This caramel, coconut delight soothes the tongue with just one bite. The silky taste hits straight into my soul. So naturally, I gave Samoas the most soulful partner of all, R&B. This genre’s urbane beats and smooth lyrics make for the perfect romance. If this combination were to take on human form, it’d probably be John Legend. Girl Scout Cookies are always a great idea, but throw on some jams while you're at it and you've got yourself a damn good time. Don't know where your local Girl Scouts are going to be hustlin' next? You can actually type in your zip code and find out their weekly schedule featuring place, dates, and times on this app. Get to shopping, pull up your Spotify, and start munching.